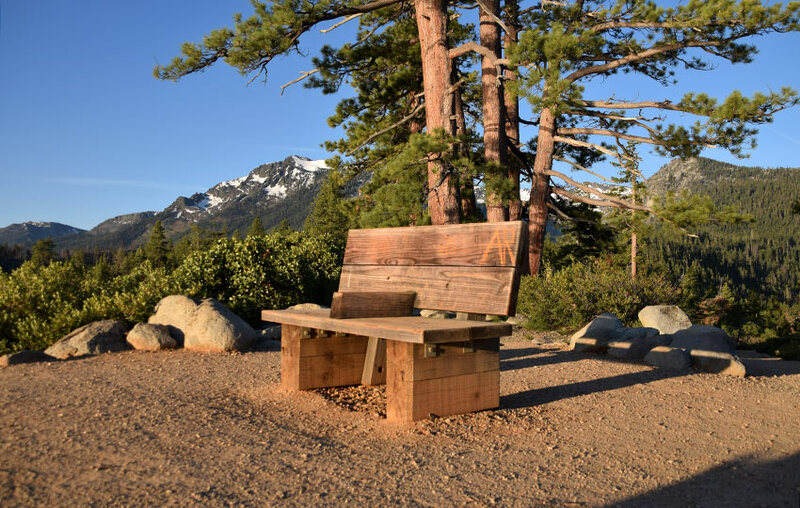 The hike to the Eagle Point Campground Vista Point (featuring a wooden sitting bench) is more like an after-dinner walk you’d take with your toddler than an actual hike. That’s not to say this short trip isn’t worth your while. In fact, I would say the ends justify the means in this case because for very low effort (1.25 mile round-trip road walk through Eagle Point Campground) you’re rewarded with stunning views of Lake Tahoe, as well as Freel Peak, Jobs Sister, Mount Tallac, Maggie’s Peaks, Emerald Bay, and glimpses into Desolation Wilderness. Just know that this short trek is more about the views revealed at the end of the hike than the actual hiking, so look elsewhere if you seek an aerobic Tahoe hike featuring lots of miles and elevation gain. This hike has neither. My recommendation for the trip to the Eagle Point Campground Vista Point is to get up early and go watch the sunrise from its wooden bench. Click on the above map to enlarge it for better viewing and printing. This map is only for reference and shows the general route to the vista point at Eagle Point Campground. Always carry a traditional topographic map and compass when traveling in the backcountry. Please note that the “start” and “stop” icons are actually reversed on this particular map because I recorded the route while walking back to my vehicle. The parking for this hike is very limited as it’s restricted by its geographical location. Essentially, you’ll park off of the side of the road (SR 89) near the entrance gate to the Eagle Point Campground. No matter the season, never block the entrance gate to Eagle Point Campground (or any other green gate around Lake Tahoe, for that matter). And be mindful of where you park along this moderately narrow strip of road. You don’t want to cause an accident or receive a parking violation. The entrance gate and this section of road is located after the second hairpin turn (counting the turn near the private road to Cascade Lake) you’ll make traveling north along SR 89 in the direction of Emerald Bay. It’s easy to miss this spot as the entrance gate is slightly recessed from the road, so be prepared to pull over after making that slow and tight second turn. The trailhead is the entrance gate to the campground. Here’s a map to help you find the entrance gate to the Eagle Point Campground. From the entrance gate to Eagle Point Campground walk along the main road for a distance of just over half of a mile. At this point, the road will start to curve to the left and begin to descend. There is a dirt path (approximately three feet wide) that shoots off to the right. This is the trail that leads to the wooden bench at the vista point. There are no signs indicating the trail or where it leads to, so if you find yourself still walking on the road and heading down a long straight stretch, turn around. You’ve probably passed the trail and you just need to go back and look closer for the dirt path. When you find the path and make your way to the wooden bench, have a seat and take in the views. Return to your vehicle along the same route you took to reach the vista point. Last thoughts … For a number of years during the 2010s, the Eagle Point Campground was closed for various reasons. Although camping and use of the facilities within the park was prohibited, public access (i.e. walking around the park) was never denied. I stumbled into the park during its closure years while searching for a trail to Eagle Point at lake level (which there is not). Starting at Vikingsholm I hiked the south rim of Emerald Bay, but instead of traveling closer to the water the trail climbed uphill until it spit me out on the Eagle Point Campground service road. At this point I realized where I was and began to connect the dots. I had driven past the campground a million times before, but never gave it much thought because it seemed as if the gate was always locked. And, really, how exciting is a derelict campground? The deal is, though, this campground features some incredible panoramic views of Lake Tahoe that are super easy to walk to.